The month of hearts has gone by and while I didn't fall in love with someone, I did fall in love with a place which still makes me smile even now whenever I recall it. 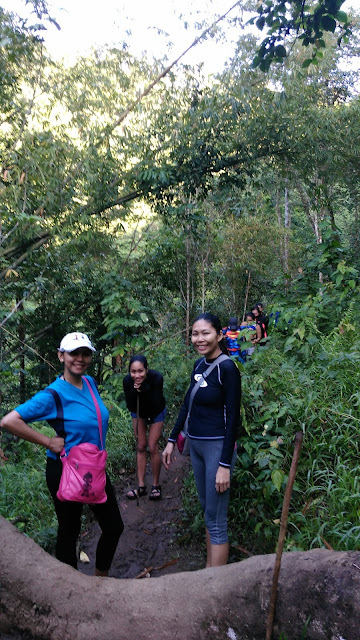 Early morning trek to Hulugan Falls with the foggy mountain peak greeting us. We were invited by some friends to spend our Valentine weekend away from the city. 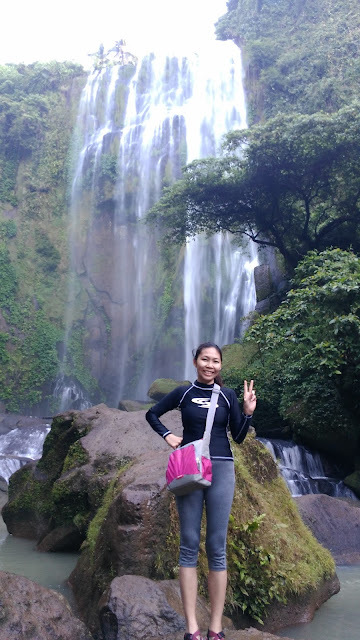 We readily said yes and opted to sweat for health so we could experience some of nature's wonders which took our breath away in at least a couple of ways. The drive to Louisiana, Laguna started at 11pm at night. I had spent the time mostly dozing in and out of consciousness since there was nothing to see of the scenery. We had one stopover and then we had arrived by 5am at the starting point for the trek. We tried to spend the extra hour trying to get a more quality nap to no avail. 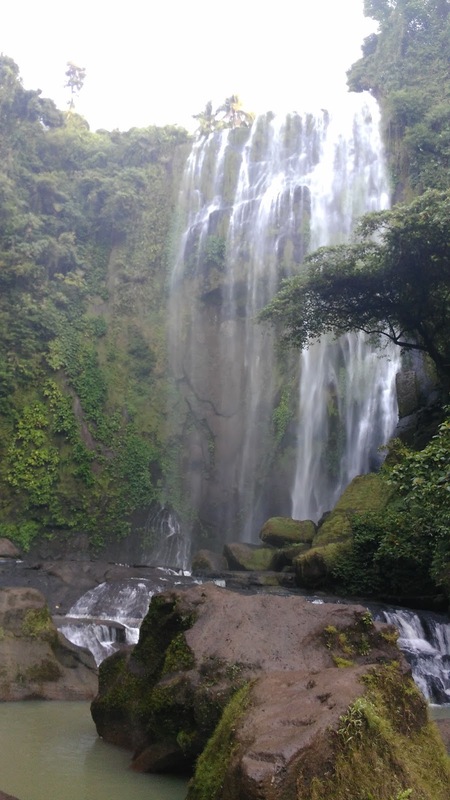 At 6am, we registered ourselves, had a brief orientation with our guide and with our mini-breakfast of pan de sal in one hand and a camera on the other, we started our trek. It was a struggle to move in the chilly morning air but once we started to walk it became more comfortable. The road to the start-off point was already cemented and the walk was a bit long. 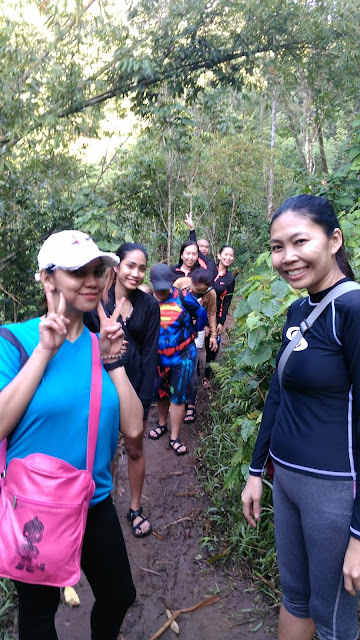 We were the first ones to start the trek so we were able to enjoy the natural sounds of the trees and the birds amidst our own chatter as we walked. Pretty soon we were huffing and puffing as the path begun to slope down. It had rained the day before and so the earth was a bit soft. Our guide said it was fortunate that it rained the day before as it made the weather more bearable and made the trail less dusty. Another pause for a break. We were too tired to take out our cameras for most of the trek but we snapped some pictures every now and then when we took our rest. 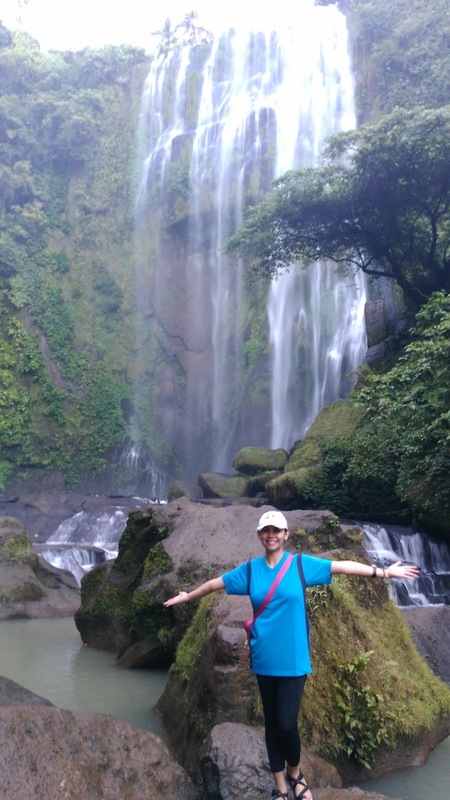 When we finally reached Hulugan Falls, our weariness was washed away. It was so beautiful to look at and even if the water was cold, we tolerated it as we stood in front of it just watching in awe. Another snap because we couldn't get enough of it. I'm sure our picture doesn't give it justice. It really is a wonderful site to see. Its best viewed in the morning so you can enjoy the refreshing atmosphere. It also gives you more time to take all the pictures you want to take because its hard to get enough of the view. Of course, we had to have our obligatory pictures as evidence that we were actually there. After all, the whole trek took over an hour to accomplish. Sarah and her glad-to-be-here pose. We couldn't take more pics from the phone or camera since the water splashing from the rocks got us soaked and we didn't bring a waterproof cover for the gadgets. We were ok with the situation though because we were able to just enjoy the view to our hearts content without competing for picture-taking spots and time with other visitors. 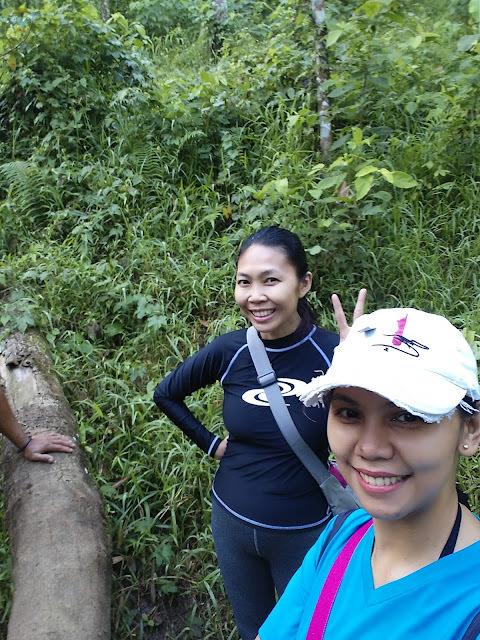 After taking photos and a little rest, we proceeded to trek our way to the next set of water falls. Hulugan Falls is the biggest of the 3 falls that we we're going to visit that day. The next phase of the trek involved higher ground. This was even more challenging than going down on slippery ground and rocks. There were bamboo poles arranged horizontally for trekkers to hold on to for support but I think we took much longer breaks this time as it took more effort to climb. We still couldn't stop chatting though and we often made jokes to keep ourselves from feeling too tired. We had a little break near one of the outposts where we had some snacks and played with some dogs. The outhouse area where visitors can also go camping. Early morning in the province always look so peaceful and quite. The dogs had collars on them by ordinance but they were allowed to roam around. They were supposed to be tied so as not to scare visitors away but I think they were the ones who are scared of visitors as they were cautions around strangers. They didn't get too close to us even when we handed them food. They waited for us to put it on the ground instead. These little guys gave us another reason to smile. After the break, we had a shorter way to go and much more level ground to walk on. We also came across other trekkers who came from other pathways. The influx of people rendered the pathways even softer so it was harder walking than when we were climbing up. 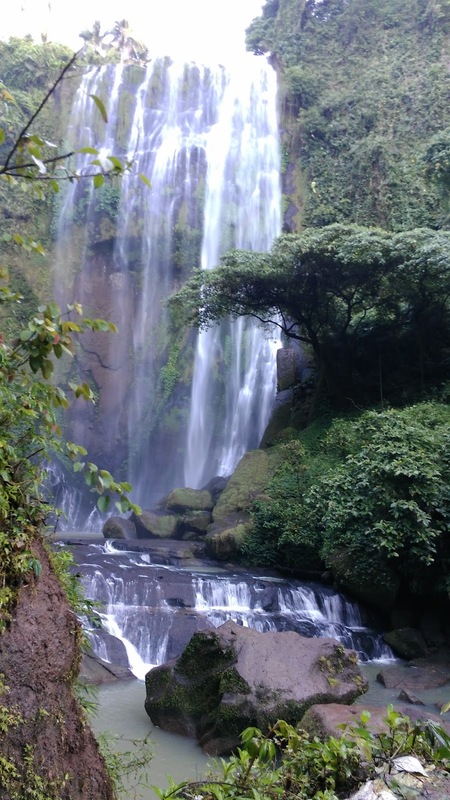 Luckily, our next destination had bamboo seats from where we could watch the next water fall a little distance away. There were also bamboo tables where we could eat but we opted to have lunch once we got back down. Beyond this, just a shorter distance away but requiring an uphill climb was another water fall. Our view of the falls from our seats. Finally got to have a group picture. Also, as a surprise, one of the dogs we gave food to at the out house followed us and was apparently looking for more food. She got her wish of course. We also had to have a snapshot with the doggie. Another one, trying to get the dog to look at the camera too to no avail. Our companions went to explore the 3rd water fall but Sarah and me were too tired to walk any further so we opted to rest and just chat with our tour guide and the other guides who also took their rest. The way back to the starting point entailed walking through even muddier trails and crossing a few shallow streams where we took even more pictures. We took the cemented path back to our starting point. By this time, it was almost mid day and the heat tired us more than the walk itself. The place where our car was parked has now become crowded. New visitors had arrived while other groups who followed after us were also coming back. The once, soft dirt road had now become quite dusty. Road side stalls had been setup where visitors can get their lunch. They also sold special bibingka which had lots of cheese. It looked and tasted really delicious so we all bought some to eat or as pasalubong. After changing clothes at the registration center, it was time to find our accommodation for the next day's adventure. I have definitely fallen in love with Hulugan Falls and I wish to go back there again just to stand in awe at its beauty once more. Images from Sarah's phone and camera.